Most of us would agree that LinkedIn is great for communicating in a business environment. But how much can actually be achieved if LinkedIn is used as an advertising platform in recruiting? There are now more and more companies promoting their job listings on LinkedIn. With LinkedIn ads, you can get more attention than you might expect. Even in a passive candidate environment, where candidates are not actively looking for a job, LinkedIn ads are extremely relevant. If you've never created an ad on LinkedIn, you can learn how by reading the following tutorial. We will explain step by step how the process works. There you can choose to show the ad as "sponsored content" or as a "text ad". For our example, we have chosen the text ad. If you haven't created an advertising account before, you will now have the opportunity to do so. You can give your account a name, select the appropriate currency, and indicate if you already have a LinkedIn page. Now you can give your campaign a name, which can consist of 50 characters. The name should be unique, so it's immediately clear which job you're promoting. Furthermore, this is the only way to reach the right target group. You should also make sure that you can assign your campaigns later. Once you realize how effective these LinkedIn ads are, you'll want to do even more. Below is an example of a campaign name for a job advertisement for a web developer. In this step, you can choose the language for your ad. LinkedIn does not translate your ad into a different language, but you can create the ad here in the language you want. Now it's time to start creating the ad. First, select where to direct people who click on the ad. For example, if you want to advertise a specific job advertisement, you may want to send them directly to the landing page of the job posting. However, you can also continue to take them to your LinkedIn page. Only 25 characters are available for the title. You should select a title that makes your desired target group feel directly addressed. There are 75 characters available for the description. For your ad design, it's important that you choose a text that directly addresses your target audience and causes the desired viewers to click on the ad. Keep in mind that your target group is not actively looking for a job. The LinkedIn ads reach your potential candidates while, for example, they are updating their contacts on LinkedIn. You should offer clear added value if you want to convince them of your company as a good employer. A pure job advertisement is often not enough. Since only 75 characters are available in the description, you need to reduce the benefits of your company to those that are of interest to your target audience. As you can usually only attract the attention of your target group for a brief moment, the benefits should be clear and easy to understand. A meaningful image draws further attention to the ad. Again, you should choose an image that clearly illustrates the described benefits. 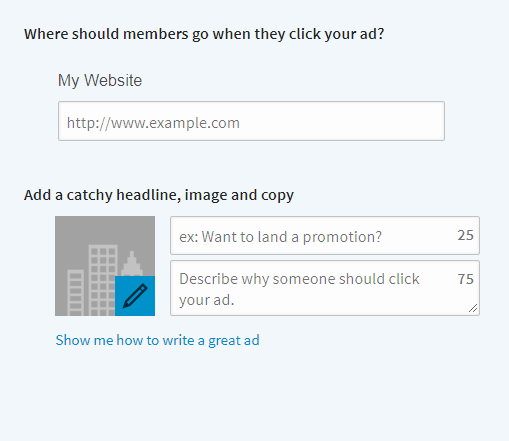 To measure the results of your LinkedIn ad, include an individual tracking link in your job ad. You can do this by using the Talention tool. Keep track of which days your LinkedIn ad generates the highest traffic (traffic and pulse) and how many applications you receive on this channel. Here you should define your target group. You have to decide who you want to reach with the ad. Think about which audience fits the benefits description included in your ad. The more you narrow your audience, the fewer people will see your ad. Often, it makes sense to distribute LinkedIn ads more widely. While this will ultimately result in a higher cost per click price (CPC) because the ad will be clicked less frequently, you'll also get more ads so the candidates can filter themselves out. Over time, you will learn how to optimize your targeting strategy to reach your target audience more cost effectively. Next, the individual targeting criteria are briefly described. Choosing a location is mandatory. Here you can enter a country, state, or just a town or city. In general, it makes sense to choose a logical radius of about 1 hour. You should also consider where you are located. In areas with several cities, for example, it is recommended to choose a smaller radius if the cities are relatively close to each other. In a larger states with less cities, keep in mind that the cities are farther apart and choose a larger radius. If the advertisement is directed only to employees of certain companies, these companies should be indicated. This would be the case if you want to attract a web developer, for example, from a rival company. If you are looking for a web developer, as in our example, you can directly select the industry here and make sure the ad reaches the right audience. For example, if you want to increase your chances of obtaining a web developer from a smaller business by providing successful delimiting criteria and benefits to small businesses, it makes sense to exclude the larger companies. Here you can select the position for which the advertisement should be displayed. In our example, it would be clear to choose the position of the web developer. At this point, the area in which the target group works can be selected. It's important to consider whether you want to hire a beginner or looking for a web developer who already has several years of professional experience. This selection is useful if you only want to address students or graduates from a particular university. 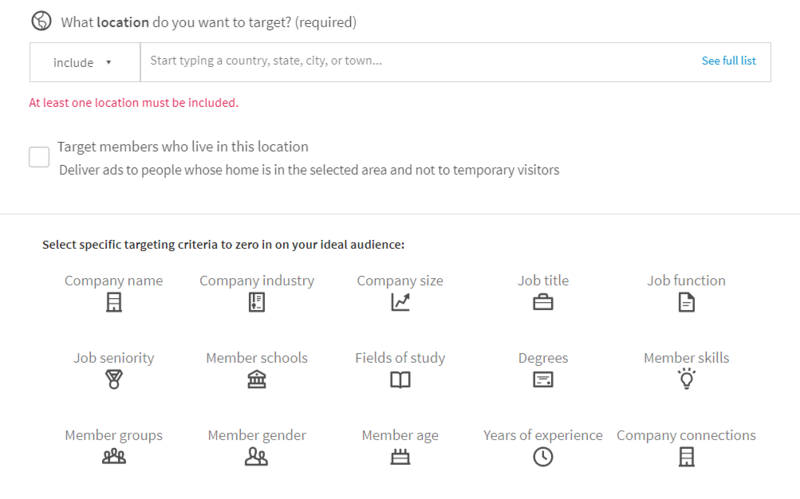 To optimize your targeting, you can choose a particular field here. Since you want to advertise your job ad to the right candidates, it is recommended to select the type of degree you are seeking for this position. If your job posting is targeted to web developers, as in our example, the target audience might be narrowed down by selecting specific skills that web developers should have. Here you can select the groups that your potential candidate may identify with. For a web developer, these will most likely be groups like "Web Developer" or "Web Designer". LinkedIn will show you some suggestions. If your job is gender-dependent, you can select the gender here. If the advertised job or landing page is aimed at a specific age group, it is recommend that you limit the target group in this regard. Similar to job seniority, you should consider if you want to hire someone fresh out of university or a seasoned professional. Much like company name, by selecting this option, you can target connections at other companies. This would be ideal if you want to attract candidates from a competitor. Now you can choose which payment method you want to use. 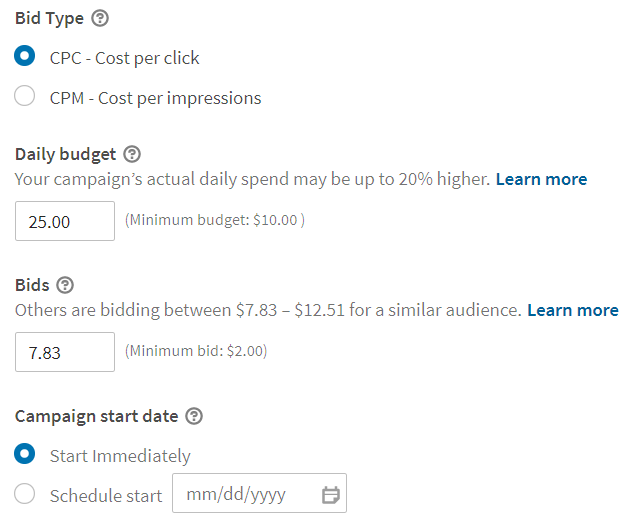 You can choose between Cost per click (CPC) and Cost per impressions (CPM). You always pay when someone clicks on your ad. You pay whenever your ad is viewed. The cost is counted per 1,000 impressions. When considering whether to choose CPC or CPM as the payment method, you first need to be aware of your goal. If you want as many clicks on your ad as possible, leading to a redirect to your job advertisement or landing page, and thus make new applications, CPC is the more sensible payment method. If your goal is for as many people to see the ad as possible to achieve increased brand awareness, CPM is the right payment method. This is where you enter the highest price you are willing to pay. For CPC, the bid refers to a click, for CPM the bid refers to 1,000 impressions. LinkedIn provides suggestions regarding the amount of the bid. These are based on which bids are made by other companies that want to target the same target group. When you increase your bid, you move up your LinkedIn ad in the competition for the ad space. Here you will enter the maximum amount that you would like to spend in one day. First, you should think about how many clicks you want to reach per day or how often your ad should be displayed during the day. When you have decided, you can calculate the required amount of your daily budget by multiplying that number by your bid. You can decide here whether the ad should run immediately or if you should choose a specific date for the launch. Now you are finished and your LinkedIn ad is completed and online. 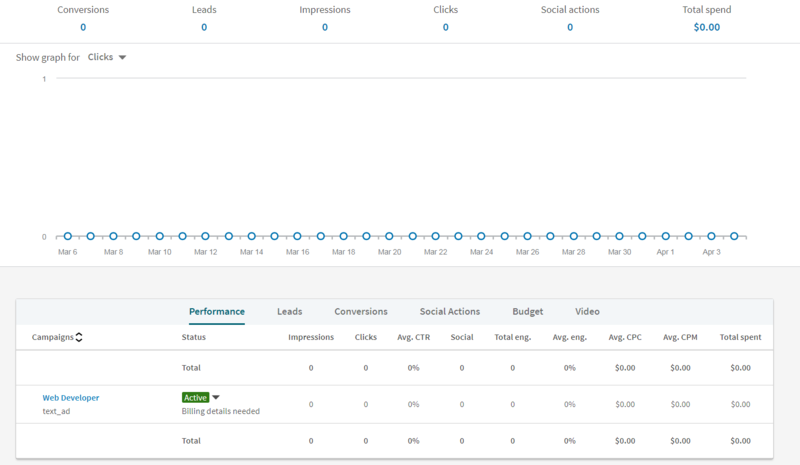 LinkedIn has the ability to track the ad using statistics, so you can optimize your ad after some analysis. We hope you have lots of success with your ad on LinkedIn! 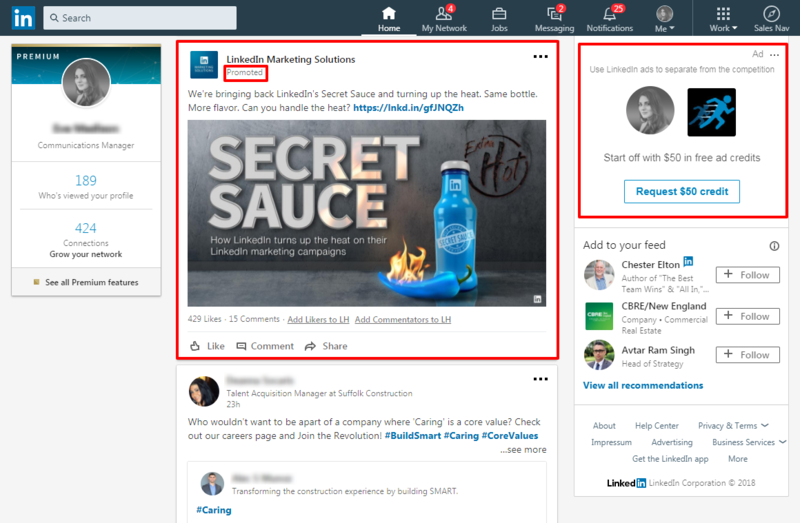 Have you already used the LinkedIn ads in your recruiting process? How was your experience with them?